Here’s Rachel Blau DuPlessis settling in at Durham, North Carolina, where she and partner Bob DuPlessis are visiting fellows for the North American academic year at the National Humanities Centre. Rachel is flagging the recent publication of Ron Silliman’s monumental work The Alphabet (U of Alabama P, September 2008), a long poem published serially over 30 years and appearing now in its full 26 parts. 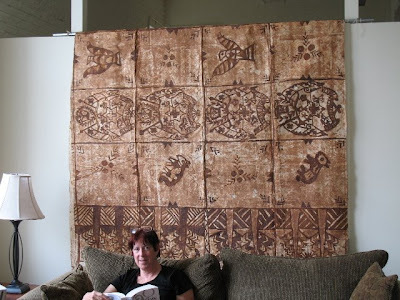 She’s also sitting under a beautiful piece of Tongan tapa that travelled from Auckland to Umbria in June when we went to stay for a few days with Rachel and Bob at their summer place in Italy. There it is (below) unrolled in full on the terrace. It was at this point we learned that Bob is an authority on, among other things, the history of textile production in central Italy (what he doesn’t know about wool, linen and the farming of silkworms isn’t worth knowing). But the bark cloth from the Pacific, involving a different kind of mulberry tree, was new to him and to Rachel. We’re glad to see the tapa is still travelling and look forward to having the roving Americans in our part of the world. They’ve been to Australia twice and they’re keen to come here. Text and textiles could be the drawcard. Rachel Blau DuPlessis with The Alphabet. 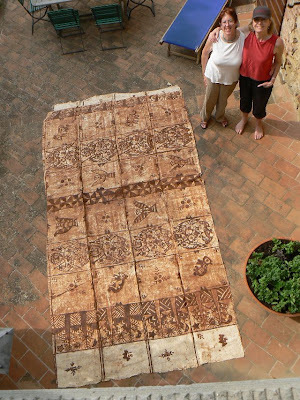 Rachel and Michele with tapa.